There are dozens of stories extolling the virtues of serendipity in science –- the discovery of penicillin is likely the most common example. How the invention of the microwave oven was inspired by a chocolate bar melting in an engineer’s pocket is another. And don’t forget the sticky note, which resulted when its inventor tried to make a super glue and wound up with reusable low-tack adhesive, instead. While these stories are often described as fortuitous accidents, there’s a lot more to it than fortune. The true thing that differentiates an oops! moment from a Eureka! one? The ability to recognize when you’ve made a real discovery -– not just a mess. The scientific community is not the only place where skill and observation masquerade as coincidence; the history of payment service provider (PSP) WePay has some of the same plot twists. 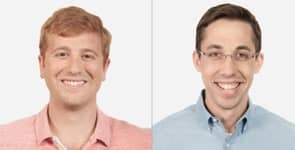 Founded in 2008 by friends Bill Clerico and Rich Aberman (CEO and CSO, respectively), the WePay of today looks very different from their initial startup. WePay was founded by Bill Clerico, CEO, (left), and Rich Aberman, CSO, who met in college. WePay began life as an idea: a platform where people could pool funds for group expenses — like shared vacations or club events — without a lot of headache and hassle. In just two years they had a viable product and were ready to storm the market. Unfortunately, the market had other ideas. “There just wasn’t enough repeat business in those ski trips and club activities,” explained the WePay team. “Low margins on low-value transactions didn’t help, either.” They tried to expand their demographic with a number of other ventures, including a series of platforms and applications, but the company failed to grow as much as they hoped. The slow-growing startup’s abrupt change in focus transformed WePay, turning it into a fully-fledged PSP in no time. The company’s new slogan — “Do You Platform”? — is quickly becoming ubiquitous in the fintech world. While there have been plenty of payment facilitators wrangling for the SMB dollar, WePay has set itself apart by acting more like a silent partner. Its goal is to allow the platform to maintain their own branding throughout the entire transaction. 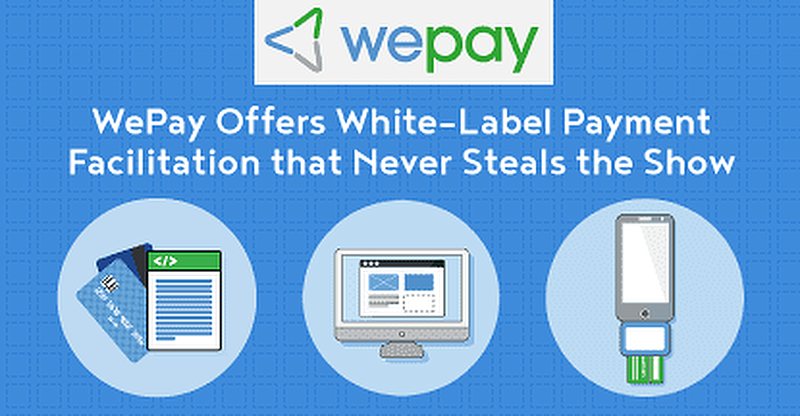 As a white-label product, WePay can be your platform’s little secret — the buyer never needs to know. WePay offers personal consultations, working together to create the perfect solution for your business. Not with WePay. It allows for a fully customizable interface, making it easy to control the look and feel of every stage of the transaction. Everything from initial signup, to the checkout and confirmation email, can be chosen by the platform. If your needs are too large for its plug-and-play forms, WePay will develop a customized software solution just for you. For those who don’t work with online marketplaces, WePay launched its point-of-sale (POS) product line earlier this year. “Ninety percent of commerce happens in person,” said Bill Clerico when discussing the new products, which include a comprehensive mobile SDK and portable card reader. The readers will accept both EMV and magnetic stripe cards, from all of the major providers, and plug directly into mobile devices. The products also sync automatically with the merchant’s digital information — no need to manually enter any data. WePay’s white-label service also extends to the mobile and storefront products, allowing software companies to brand in-person payment devices under their own banners. The companies can then package an omnichannel integrated solution to their consumers, never needing to rely on an outside third-party provider. WePay’s bread and butter is in the back end, so it’s only natural that the company took the time to create extensive tutorials and guides for novice and pro developers alike. Each feature has a complete write-up explaining how best to integrate, including example graphics and step-by-step coding guides in PHP, Ruby, Python, and cURL. The developer page at WePay offers step-by-step guides for integration. The guides offer simpler solutions for the less back-end-fluent, including easily embedded co-branded forms for signup and checkout. There are easy-to-follow directions for entering their simple code into any page builder. For users who want to completely customize, there are descriptions and coding tutorials for how to design a totally branded experience. Need to have split payment functionality, or delay a payment? The “Use Cases” will describe how to solve a variety of unique problems. For the professional developer — or adventurous civilian — there are extensive references for customizing the APIs, including upgrading to the latest API and a list of current permissions. The developer pages are also home to WePay’s SDKs, which are provided in seven programming languages, including iOS and Android. The company is out to prove it, too. After months spent working with banks, credit card companies, and financial regulators across the U.K., WePay announced the opening of its British offices earlier this year. “Going international has traditionally been a frustrating process for companies that offer payments,” explained Bill. “With WePay, platforms can now integrate once, and immediately offer the same level of payments service on both sides of the Atlantic.” Of course, they don’t plan to stop there. “The platform movement knows no boundaries,” added Bill.